Entry level espresso drinkers can spend under $500 and get a serviceable machine which will meet most of their needs. Advanced espresso drinkers can spend thousands to find something that pulls the perfect shot. For those in the latter group, a copper espresso machine combines form and function. And copper espresso machines from Microcasa and La Pavoni are the best you’ll find. 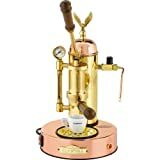 In this article I wanted to compare the leading copper espresso machine models from these two manufacturers to give you an idea of which is better suited to your needs. If you’ve ever tried one of these models, please comment below and let us know what you thought about it! Forget the loud pump associated with other high end espresso machines. The Microcasa Semiautomatica is powered by your own hand! The Microcasa Semiautomatica is a Heat Exhanger (HX) espresso machine, which differs from your typical double boiler espresso machine. A double boiler espresso machine has two separate boilers (surprise! ): one for espresso and one for steam. An HX espresso machine has a single boiler kept at steam temperatures. When hot water is needed to pull a shot, cool water is pulled from the reservoir and flash heated to the proper temperature. It’s a more energy efficient and elegant way of temperature control. For a great read on the differences between double boiler and heat exchange espresso machines, check out this thread. Boasting striking copper and brass with soft wood accents, operating the Semiautomatica generates all of the pressure you need to extract a world class shot through the lever-powered pumping action. And no loud pump means a quieter espresso in the morning! The only downsides of owning a copper espresso machine like those on this list — which give you a great “feel” while pulling a shot — is the manual cleaning required. Have a few towels ready to wipe down components as you go! Beautiful copper and brass finish combination. Brass eagle situated on dome. Large, round base (10 in. diameter). Water level sight glass indicates level of water in boiler. Who is this model for? A classic European espresso machine with an amazingly durable copper and brass design, the Microcasa Semiautomatica is for the discerning, experienced espresso drinker who values both elite performance and rustic design. 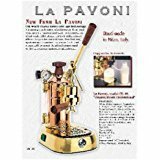 With the same hand pump lever as the Microcasa, the La Pavoni PB-16 pulls an amazing shot with almost no noise. The 1100W heating element prepares up to 38 oz of water so you can quickly make up to 16 double shot servings or 32 single shot servings without refilling. Note that this automatic frothing attachment is a something the other two copper espresso machines on this list do not have. With an included automatic frothing attachment, the La Pavoni PB-16 is a great choice for those who want to take the guesswork out of their cappuccinos and lattes. But you have to be OK with the smaller 38 oz boiler capacity. The Coffee Maven is a participant in the Amazon Services LLC Associates Program, an affiliate advertising program designed to provide a means for sites to earn advertising fees by advertising and linking to Amazon.com, Amazon.ca, Amazon.co.uk, and other Amazon sites. We may be credited a small commission for any purchases you make, but you are not charged extra. Amazon pays us this fee as a thank you for referring that sale. If you have any questions about the Affiliate Program and how it works, please don’t hesitate to contact us. The Coffee Maven is a participant in the Amazon Services LLC Associates Program, an affiliate advertising program designed to provide a means for sites to earn advertising fees by advertising and linking to Amazon.com.